... With less sagging, bagging, and dark circles that add years to your real age! Eyelasticity™ has been formulated with a series of active ingredients that have been clinically proven to significantly reduce factors that contribute to eye-aging. with 70% of test subjects reporting noticeable results in just 14 days! with a 21% improvement in overall Skin Smoothness! while Puffiness & Bagging showed a 32% reduction! For Smoother, Firmer, Thicker-Looking Skin! ... To read more about these clinical trials, click here now! To Reduce The Effects Of Eye-Aging On REAL Women! It's important to note... This is not a "combination cream" for overall facial anti-aging with a few beneficial eye ingredients tossed in. 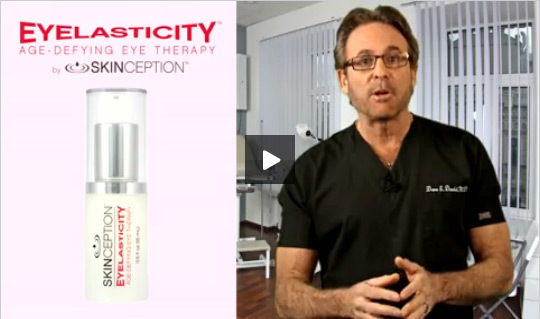 No, Eyelasticity™ is 100% focused on giving you more youthful looking eyes! ... For beautiful, expressive eyes that simply look more youthful! Clinically Proven To Reduce Dark Circles & Puffy Eyebags ...By 70% In Just 28 Days! Topical Alternative To Botox, Excellent For Decreasing Expression Lines & Wrinkles! 78% Of Participants In Clinical Trial Reported Improved Skin Smoothness! Proven In Study To Increase Skin Moisturization By 100% In 14 Days! 47% Improvement In Wrinkles Was Measured After 8 Weeks Use! ... With BEST Results After 90 Days Use! ... We recommend using Eyelasticity™ for a minimum of 90 days to see the fullest results, with ongoing daily treatment to maintain the age-defying effects. Remember: You're working to reverse signs of eye aging that have occurred over time. This takes time and a commitment to the product. Please try our product for 90 days (3 boxes) and if for any reason you are not 100% satisfied, simply return the three empty boxes within 97 days from the time of delivery for a full refund excluding shipping charges. If you wish to take advantage of the price discount by ordering multiple boxes don't worry. Any unopened boxes returned along with your first three opened boxes within the 97 day guarantee period will also be eligible for a full refund. How can we make this incredible guarantee? Because we KNOW you will be satisfied with our product. Please do not ship any product back after the 97-day refund period has expired. Please feel free to try our products, but refunds are limited to one order per customer.